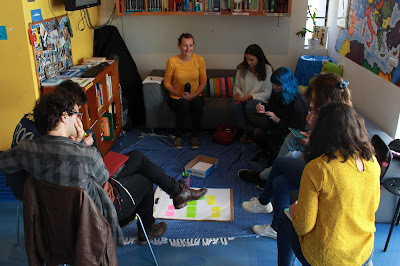 This weekend our EVS volunteer Marta from Slovenia organized the workshop „How to shine in the field of creative industries“ and shared her knowledge about it. Being an official, lawyer or secretary is not for everyone. Some people are more attracted to the creative field as it offers a lot of opportunities for professional self-fulfillment,individual responsibility and creative work. However, this freedom brings challenges as well. How do you know which skills are actually required? How do you make people value your work and set your prizes? These questions are especially hard to answer for young people who have little to none experience in the “real“ working world. That is exactly why Marta decided to organize the event to tackle these questions and build the workshop around them what resulted in a vivid discussion among the participants who all come from different fields of creativity. May it be music, arts or graphic design, we had them all! Since there was such a huge variety in the background of the people, questions were answered from a lot of different perspectives. It started with a brainstorming about skills that you need to have in order to succeed in the creative field. Apart from the technical skills, such as knowing how to play an instrument or how to work with specific computer programs, the participants added that their work also includes a lot of interacting with people. Therefore soft skills are very demanded as well. The ability of reading between the lines regarding clients needs was one of the few soft skills that people agreed on as being necessary for example. One of the next mentioned steps was to learn about the industry. Regarding this it is important to continously inform yourself about possibilities and developments in universities, join associations or creative groups for further collaboration for example and to keep up-to-date. Furthermore, there was a conversation build around the topic of how to get known and how to build your own brand. In this context the importance of networking and the ability of promoting oneself was also strongly emphasized. Regarding the latter aspect, another addressed issue was the advantage of having a portfolio to present yourself. However, most of the participants did not have one and the opinions about that differed. The majority of them said that being active on social media is very important to reach out to potential clients and in a way also easier than a portfolio because the different employers require different types of portfolios. Another possibility of getting known better could be to participate in contests which a lot of the attendees have already done and to engage in the local community. After having considered all these things the only thing that is left is the implementation. The message of the workshop was clear here: Just do it! It was added that it is important to find a niche in which you can fit and start to gain experience. On the other hand, participants agreed that you also have to get used to rejection as it is part of the process. In the end, everyone agreed that it would be beneficial to attend more workshops of that kind in order to talk about topics more in detail that have only been touched upon briefly. So watch out for more workshops from Marta!